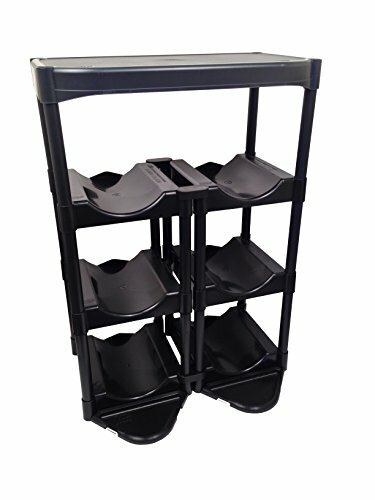 Now you can configure your 5 gallon water bottle supply to fit any unique space with the Bottle Buddy, Complete Storage System by Tailor Made Products, Inc. Each bottle shelf is made of high density Black Plastic with an in-molded well which holds 5 gallon water bottles securely in place. The Flat Shelf holds up to 80 pounds and offers endless possibilities for use in retail displays, office beverage centers, garages, or even Zombie Shelters! The Complete system includes 6 trays, 20 legs, 4 top caps, 1 heavy-duty flat shelf, 2 floor protection kits, plus 2 twin cap and connector stabilizer units. The Bottle Buddy Storage System is super easily configured and packaged in a space saving box. Please note: Water not included. Launched in 1997, our Bottle Buddy all-plastic storage line is proudly manufactured in the U.S.A. This unique line efficiently saves space just about anywhere. Our Bottle Buddy will never chip, rust, peel or corrode. The rack is designed and tested to store 3 and 5 gallon water bottles, thus eliminating potential messes from cumbersome bottles on your floor, via stacking and storing out-of-the way. Flat shelf holds up to 80 pounds; offers endless possibilities for use in retail displays, office beverage centers, garages, or even zombie shelters!